If you're on Twitter, you probably already know Calvin Lee, principal and creative director of Mayhem Studios. Calvin is one of the most helpful designers on twitter. You can always depend on him to tweet/retweet an interesting article, answer questions or make a witty comment. In this interview by Grant Friedman, owner of Colorburned Studios, decided to stray away from the usual questions about design, instead, asked questions about how Calvin became one of the biggest design tweeters out there. 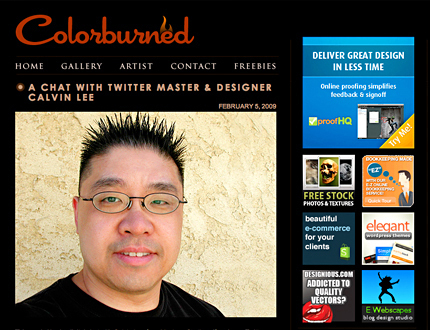 Head over to Colorburned Studios and read the interview, A Chat With Twitter Master & Designer Calvin Lee. Follow @mayhemstudios and @colorburned on Twitter. Grant Friedman is the creative mind behind Colorburned Studios, a freelance design studio. Grant started his website as a means to showcase his artwork and designs as well as to share his thoughts on current design trends. Colorburned Studios offers unique design resources and tutorials to other designers who may be interested in learning some new techniques. Grant started as a designer in 1999. Volunteering to design a e-newsletter for an organization, which he was involved with. From that moment on, he was hooked. He spent most of those early days designing websites for organizations and individuals. It wasn't long before his interest in web design spawned into a passion for design in general. Today, his passion for design includes; graphic design, illustration as well as print and web design. Over the years, Grant has worked for a number of businesses, organizations and individuals on a number of projects, in a variety of roles. So what do you say to people who say that Twitter is overrated? It seems like the quality of my Twitter feed has been trickling down over the last, say, six months. It seems like the quality/quantity problem all over again.